Today I swapped the pixel art standard blocks out for much better assets provided by my friend who has been working on the Robot game project with me. 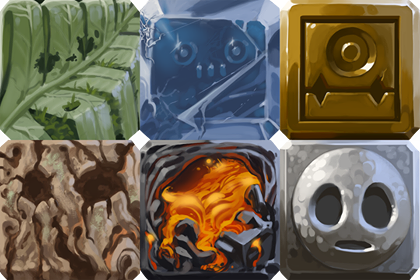 Longer term he is planning on working on some background assets and such, but as a first step he drew new assets for the standard blocks in order to change the art style to enable more interesting backgrounds etc later. and the block types to match. New textures out of the way I decided implement camera shake whenever garbage blocks fall to add some visual interest and weight to the blocks. To make this change easier I pulled the WebGL specific parts out of graphics.js into webgl.js in order to separate out the graphics api functions from the webgl integration. Then I added a shake function with associated delay and amount constants which gets reduced by a certain percentage each frame. The idea here is to build a function which sets a shake level that determines how much to move the screen. I then store the camera offset in the currentShake variable which gets used in the image call to offset the texture positions vertically by a random amount. Now when run, any time a block falls, the screen shakes up and down before tapering to normal position again. Thats it for today. I may not get to post tomorrow because I am flying to a friend's wedding, but I will try to get a daily post finished on the plane. If I don't I have all of Thursday to work on personal projects, so I will get it done then instead.